Our 100% non-smoking property features 333 warmly appointed guest rooms with all the comforts of home – plus more! See the full list of what each room has to offer. 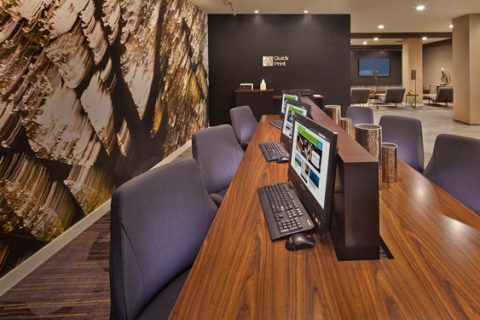 Our spacious lobby offers a number of unique areas to gather or relax, along with the GoBoard Touchscreen for Info on the Go We provide free wireless high-speed Internet in all of our public areas, so you can work as well as unwind. 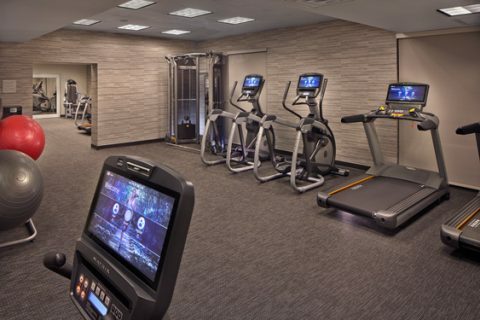 Visit our exercise room whenever the urge strikes, with access available 24 hours per day and equipment like treadmills, weight machines, exercise bikes, and elliptical machines (Guests under 16 must be accompanied by an adult). Our Indoor Pool is open daily from 6 AM to 10 PM, and is another great location to relax after a long day. Located just off of the lobby, our self-service Business Center is also open 24 hours per day and is free to all of our hotel guests. It features computer work stations with Internet and email access, as well as color printing and copying services. Looking to explore the surrounding area? Our hotel shuttle makes hourly drop-offs from 8 AM to 8 PM, and stops at the stores and shops along City Avenue, on Main Street Manayunk, at the 30th Street Train Station, and the Pennsylvania Convention Center. Our hotel is surrounded by the Philadelphia-area Colleges and Universities, and is only 4-½ miles from the Pennsylvania Convention Center. Located within the Bala Cynwyd business district, and centrally located for all of your travel needs within Philadelphia, Conshohocken, and Valley Forge, the Courtyard Philadelphia City Avenue is the spot for all of your business and leisure needs.